History’s Corner – November 2018 | F.F.A.M. 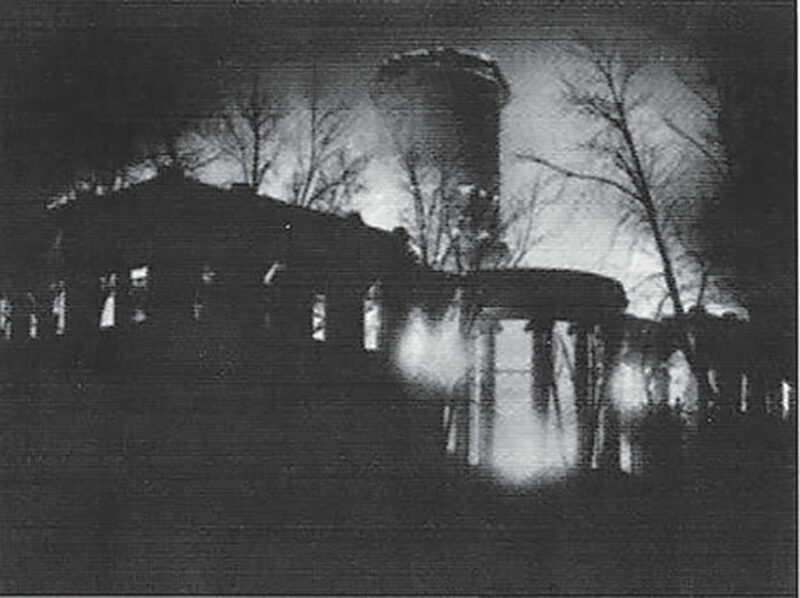 November 15, 1837: A late evening fire destroyed the State Capitol. Witnesses reported seeing smoke of unusual appearance coming from the building. An alarm of “Fire” alerted legislators and citizens, but no fire company was yet formed. The building was a total loss that night. On November 25, 1837, the Jeffersonian Republican pleaded with the population to form a fire company. In 1840 construction was completed on a new Capitol building on Howard’s Bluff, just above the location of the first Capitol. December, 1841: Fire destroyed the Governor’s house. Also in 1841 fire destroyed most of the prison that had been constructed in 1836. By now fire had caused significant damage in the new state capitol and changes needed to be made. 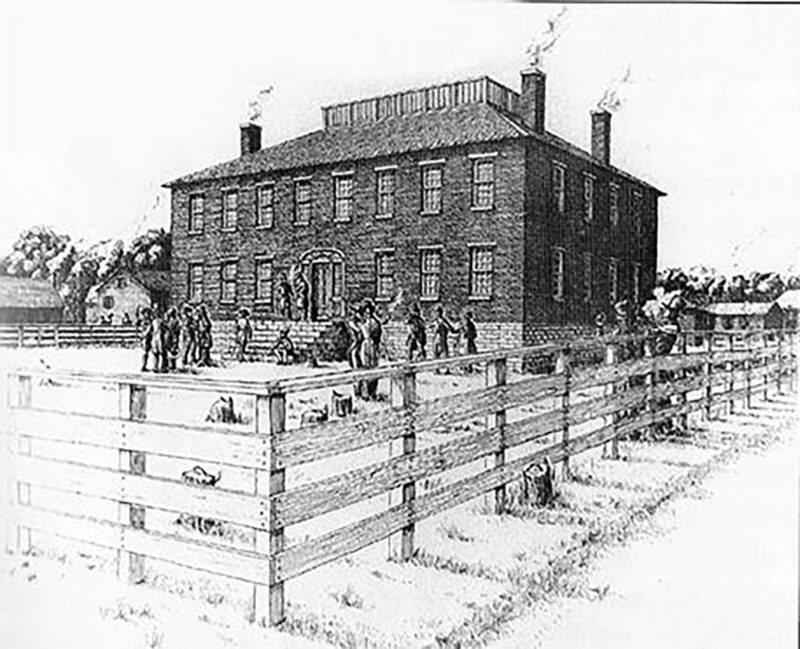 January 26, 1842: A meeting was held in the Cole County Courthouse for the purpose of organizing fire protection for the new Capitol City. A fire committee was appointed by the City Council and Jefferson City’s first Fire Chief, John Gorden, was appointed. 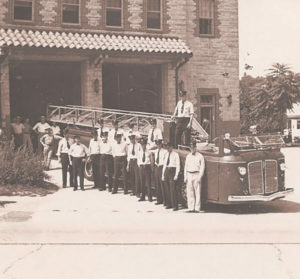 Over the following years, a number of volunteer fire companies were organized in the city with a variety of hand and horse drawn equipment provided. February 23, 1883: A fire described as a conflagration all but destroyed the Jefferson City Penitentiary. Rioting prisoners destroyed much of the city’s fire hose and all of the state fire hose. When the rioting ended the next day, there was $300,000 in damage. This will not be the only prison fire in the Capitol City’s history. History will repeat itself on September 22, 1954 when a riot breaks out at the Penitentiary. The riot persisted through the night and when the fires were extinguished the next morning by noon the damage exceeded five million dollars. 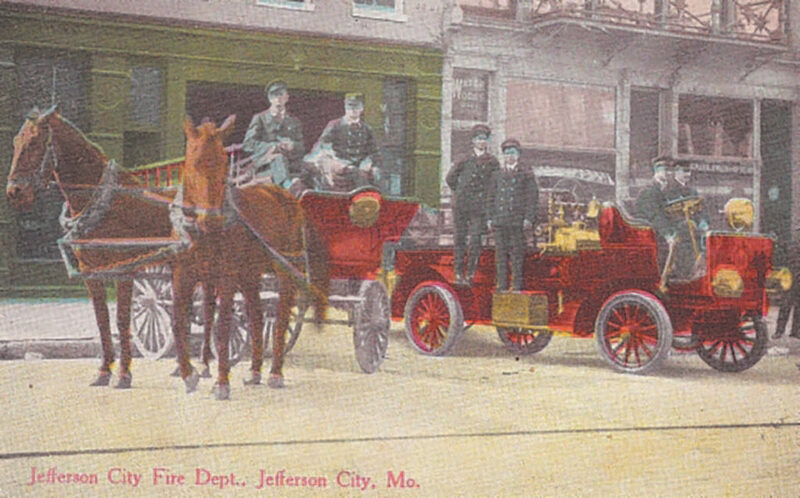 October 7, 1912: The Jefferson City Council passed ordinance 1089 creating a new, modern paid fire department. Four firemen would now work 24 hours a day, seven days a week. They would be paid $50 per month and receive four hours off per week for personal business. August 13, 1940: Delivery of the new American LaFrance model JOX aerial ladder to the Jefferson City Fire Department. This photo also shows the entire fire department staff at the time of the delivery. In the background are also five men who served as volunteer Fire Chief’s in Jefferson City. September, 1953: Fire Chief John Sullivan standing next to his new 1953 Chevrolet staff car. John served as the Fire Chief of the Jefferson City Fire Department from 1949 to 1968. I had the good fortune of meeting and working with Chief Sullivan in the early 1960’s after being employed by the University of Missouri as a fire and Civil Defense instructor. 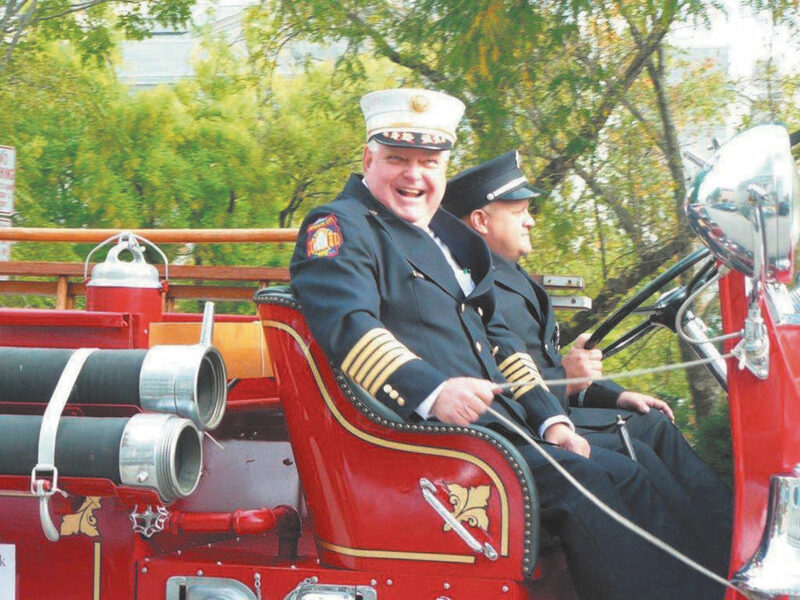 He was a gentleman and served his community with great pride. 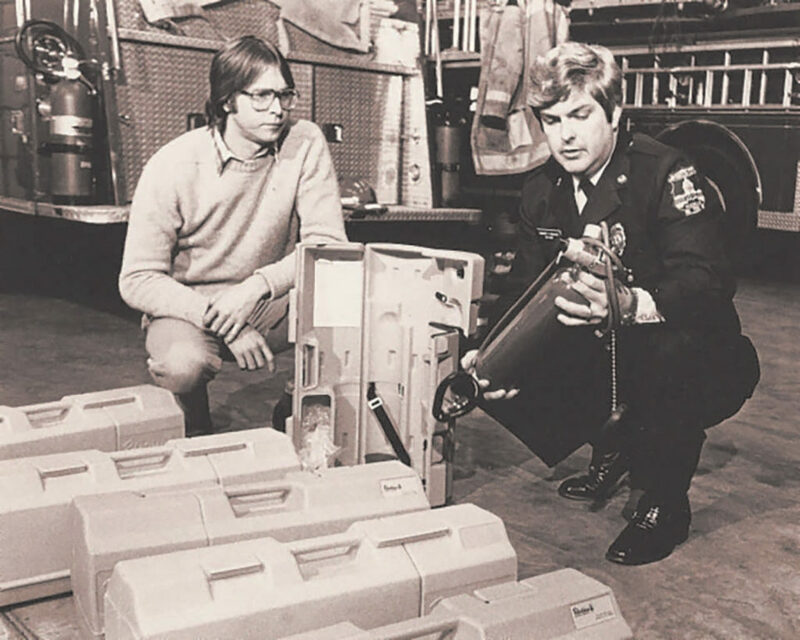 He also worked closely with the Fire Fighters Association of Missouri and the University to provide equipment for training around the state and the State Fair Operation. 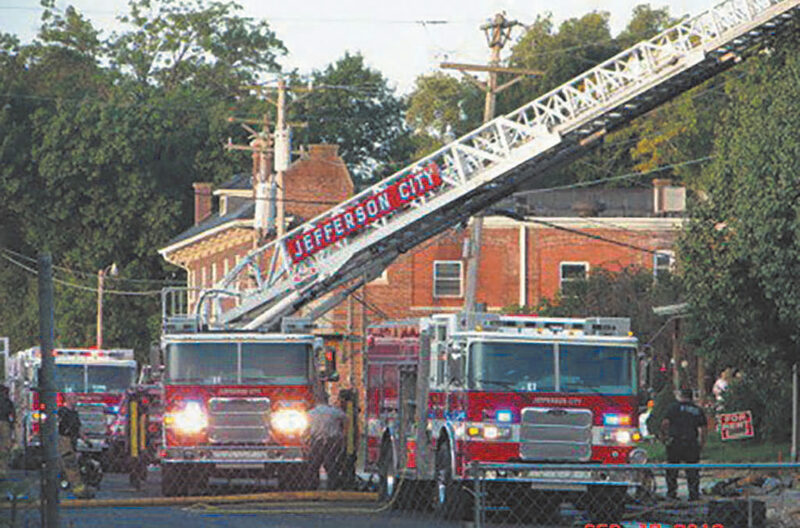 For over 170 years the Jefferson City Fire Department has met the challenge of service to its citizens. In September of 1940 fire fighters in the department formed Local 761 of the International Association of Fire Fighters. Jefferson City firefighters are represented by that organization today. In September of 2014 Fire Captain Matthew D. Schofield was appointed as Jeff City’s new fire chief. He holds an Associate Degree in Fire Science from Ozark Technical College; a Bachelors of Science from MU and a Masters Degree in Business from William Woods. JCFD responds to over 5000 annually operating from five fire stations and has a state of the art training facility. The training facility was also used to support the states Summer Fire School for years. This is a reprint from an article I did in the March/April issue of the Fire Fighters Association of Missouri Newsletter. It reflects the life long commitment Chief Bob Rennick has had to serving and providing leadership in many capacities and in many communities in Missouri. I consider it an honor to have known him and been a friend for all those years. 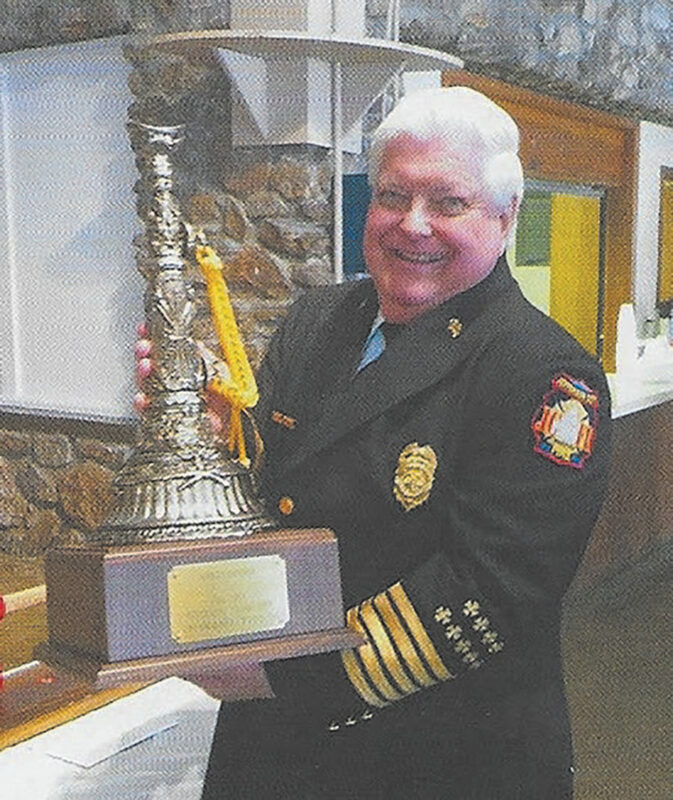 He has the distinction of being the longest serving Fire Chief in the history of the Jefferson City fire Department. These photos of Bob Rennick do not reflect any sort of retirement party but do show the very active firefighter Rennick at the KOMU-TV fire in Columbia, sometime in the mid 1970’s. Bob and I go way back to the early days of the Boone County Fire Department and before. Chief Rennick’s fire service activities actually started in his home town of Washington, Missouri, where the family name of Rennick is well know in community service. His roots served us well in Boone County as Bob would return from home on weekends and bring cool stuff that the Washington Fire Department would “give” us. Another advantage was the homemade “Washington wine” which would arrive in gallon glass jugs. Bob served the Boone County Fire District and the Columbia Fire Department well and has been an outstanding Fire Chief for our State Capitol for the last thirty years. I am happy to be able to call him my friend and wish him well in his retirement.